When community leaders consider investments in sustainability, resilience, and smart infrastructure, they face a dilemma. Immediate priorities drive a focus on meeting short-term needs, but strategic objectives often require a big-picture outlook. Illustrative examples are found in the sustainable energy sector. In one case, a clean-energy marketing firm offered to a municipality a long-term power purchase agreement (PPA) that would reduce its electricity costs by 15 percent while meeting its 20 percent renewable energy goal. The town conducted a competitive procurement, found the offer to be the lowest-priced option, and entered the contract. Later, however, town leaders realized that the sole-source, take-or-pay contract effectively foreclosed other opportunities to reduce costs, including energy conservation measures and the opportunity to participate in a community solar garden. A comprehensive cost-benefit analysis showed that the town gave up potentially 35 percent in overall energy cost savings and even greater renewable energy integration to reduce only the electric portion of its energy bill by 15 percent. In another example, a local government agency embarked on a renewable energy project that would offset its electricity purchases with output from a solar array on unused land. The solar developer promised that the remote net-metered project would reduce the agency’s electric bill by more than $250,000 over 10 years, and would virtually eliminate the carbon footprint of its electricity demand. While the array was still under construction, however, the community commissioned a study that assessed the feasibility of using the solar array to power a resilient energy microgrid for critical community facilities. The study showed that, as designed and permitted, the array would shut down during a utility outage, and it was located too far away to serve critical facilities without investing millions of dollars in additional infrastructure. The array was deemed useless for a microgrid. Achieving power resilience would require the community to invest in dedicated diesel generation assets, at a cost that would dwarf the savings expected from the solar array – and create additional fossil fuel emissions. As a result, community leaders decided to scale back their resilience plans and hope for the best. Wasted money, lost opportunities, and unmet needs: These are the unintended consequences of planning and development methods that focus on specific project benefits rather than on achieving strategic goals. These methods continue to prevail, because in many communities, strategic planning is viewed as complex and tedious. It introduces delays and uncertainties, often involves more people, and can lead to paralysis by analysis – a condition where nothing gets done because planners are always waiting for the results of additional inquiries and studies. As a result, community officials tend to pay lip service to strategic planning, while focusing efforts on short-term progress. Some communities, however, are finding that a disciplined integrated planning process can achieve short-term impacts while also supporting long-term strategic goals. The key is found in a familiar structure: the public-private partnership. The concept of a public-private partnership (P3) can include a wide range of projects and objectives. In recent decades, some of the most successful P3s have built transportation infrastructure, such as toll bridges and roads – built and operated by private consortia to serve public purposes. In developing countries, P3s have been used to mobilize private investment in major public works projects, such as dams and water systems. Smart City Berlin works to implement a smart-city strategy developed in cooperation with the City of Berlin and a network of technology and service companies. The initiative seeks to manage an integrated approach to planning and development of projects in communications, transportation, public safety, infrastructure, and related areas. The City of Atlanta established a Smart City Office to manage SmartATL, an initiative to coordinate investments and programs involving transportation, public safety, and sustainability. SmartATL emerged from Renew Atlanta, a $250 million project to implement a 300-mile citywide fiber network. Its next efforts include a smart mobility project in a traffic corridor near downtown Atlanta. New Paltz (N.Y.) Community Energy was established in 2016 by three local government units, the local branch of a New York state agency, and key local businesses, as a joint effort to plan and implement local sustainability and resilience projects. 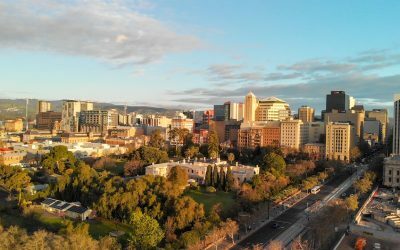 The initiative is planning a community solar farm and clean energy microgrid serving several critical facilities, and expects to facilitate other sustainability and resilience investments in the future to support cost savings and economic development. 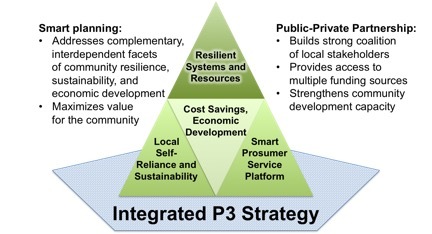 Such integrated approaches to P3s can help communities avoid the unintended consequences of “silo” planning, while bringing greater benefits at a lower cost. However, integrated P3s also present certain pitfalls and complexities that can slow progress and threaten success. Experience shows that P3s can avoid these pitfalls by applying best practices in stakeholder engagement and strategic management. Achieve broad-based support and a solid foundation for implementation. P3 Charter and Structure: Successful public-private partnerships exist to address a clearly defined set of objectives, established in cooperation with key stakeholders. The broader the P3’s charter, the greater the potential benefits – and the more complex its management will be. A successful P3 has an organizational structure with resources and processes adequate to serving the scope of its charter. P3 leaders must have the ability to achieve buy-in from P3 members, and to maintain their commitment to the P3’s goals – or to adapt those goals as necessary to address evolving priorities. Accomplished at managing efficient progress. Benefit-Cost Analysis: Successful P3s support a rigorous approach to weighing options, assessing feasibility, and analyzing the benefits and costs of recommended solutions. Although careful analysis takes time, it ultimately saves time and money that might otherwise be squandered on sub-optimal deployments. Quantitative metrics for measuring progress toward milestones and goals. These practices are important in any public-private initiative, but they rise to critical importance when a P3 forms to pursue a broader set of community goals. The effort is worth it, however, because in the end an integrated approach yields greater community benefits at a lower cost. An integrated approach to public-private partnering yields greater benefits and avoids unintended conflicts. Ultimately, smart and sustainable infrastructure is only as smart as the leaders who plan and implement it. A broad-based P3 approach, with a focus on stakeholder engagement and disciplined management, is most likely to yield the best possible outcomes for any community. 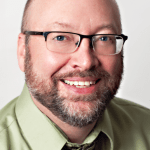 Michael T. Burr is Director of Microgrid Institute, a collaborative organization that analyzes factors affecting distributed energy resources, and supports development of resilient and sustainable local energy systems. 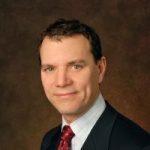 Jeffrey Domanski is Senior Manager of Energy and Sustainability at the Institute for Building Technology & Safety (IBTS), a 501(c)(3) nonprofit established to provide services to help governments implement cost-effective services and address challenges. This article was originally published by Meeting of the Minds on January 23, 2017.